An unnamed undergraduate of Veritas University was suspended for making noise during mass. This was revealed in a letter passed to the erring student. The student was suspended for three weeks. He was told to return alongside his parent when returning back to school. 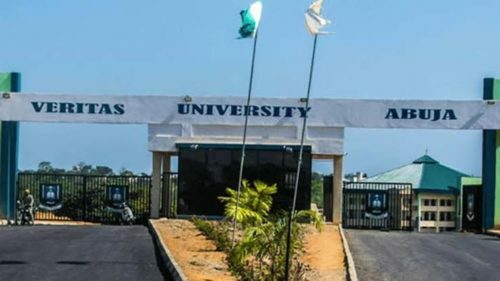 I write to inform you that the Vice-Chancellor has directed that you be suspended for making noise while mass was going on 30th March, 2019. 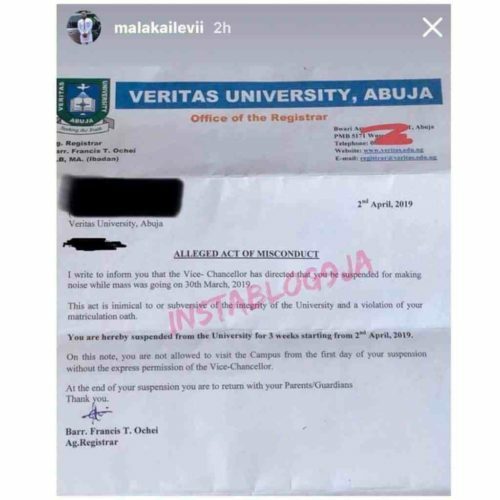 This act is inimical to or subversive of the integrity of the University and a violation of your matriculation oath. You are hereby suspended from the University for 3 weeks starting from 2nd April, 2019. On this note, you are not allowed to visit the Campus from the first day of your suspension without the express permission of the Vice-chancellor. At the end of your suspension, you are to return with your Parents/Guardians.